Okay, maybe I’m being a bit *ahem* retentive about this. But I’m seeing lots of threads where people ask a question with the inevitable “can we see the CoH Helper and Hijack This logs?” followup. As such, here’s a nice little guide to asking for help here on the forums and what you can do to minimize the delay between the initial question and a (hopefully) definitive answer. Also! I have recorded a quick (22 minute, yeah, apparently I’m as prolific on video as I am in a text editor) walk-through of the procedure and put the video online for people who might be a little squeamish about the process. 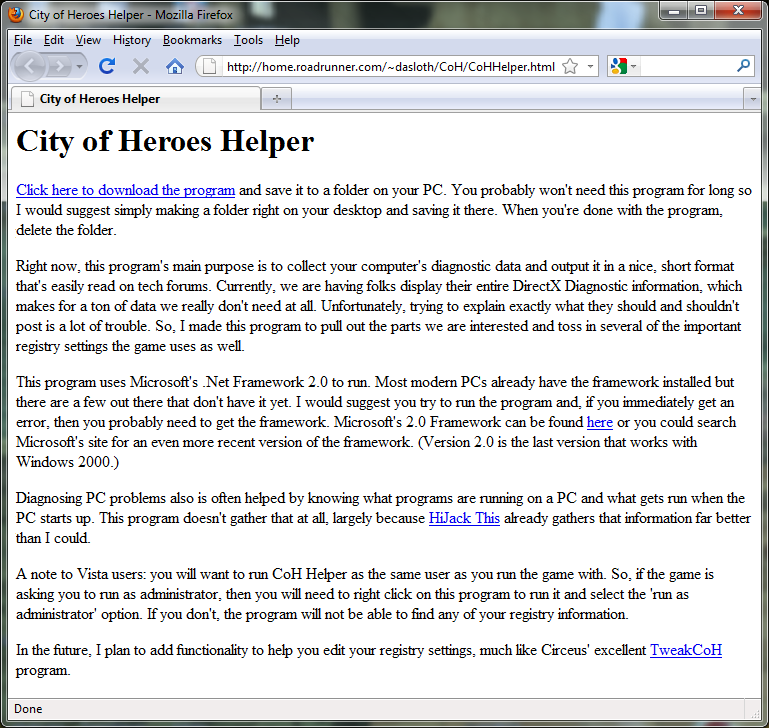 Step Number 1: Go to the CoH Helper Site. Step Number 2: Click on the link to download it. 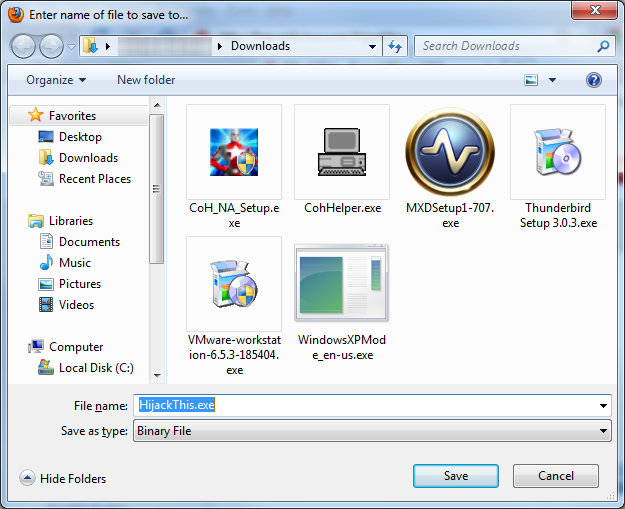 Step Number 3: Save the file. 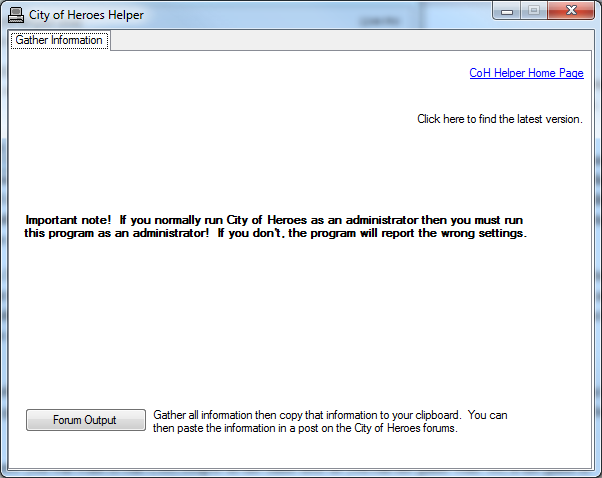 Step Number 5: Click on the Forum Output button to generate your CoH Helper log. 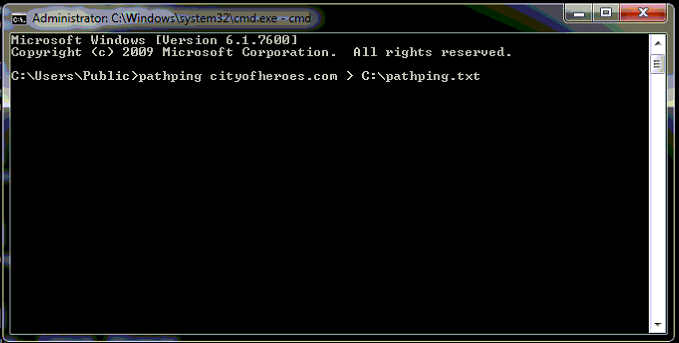 Step Number 6: Paste the output from CoH Helper into a text file. You want to do this because you have a few more things to grab before you paste this into a forum post. You can also save this file in case you have a crash on the computer and need to come back and post it later. 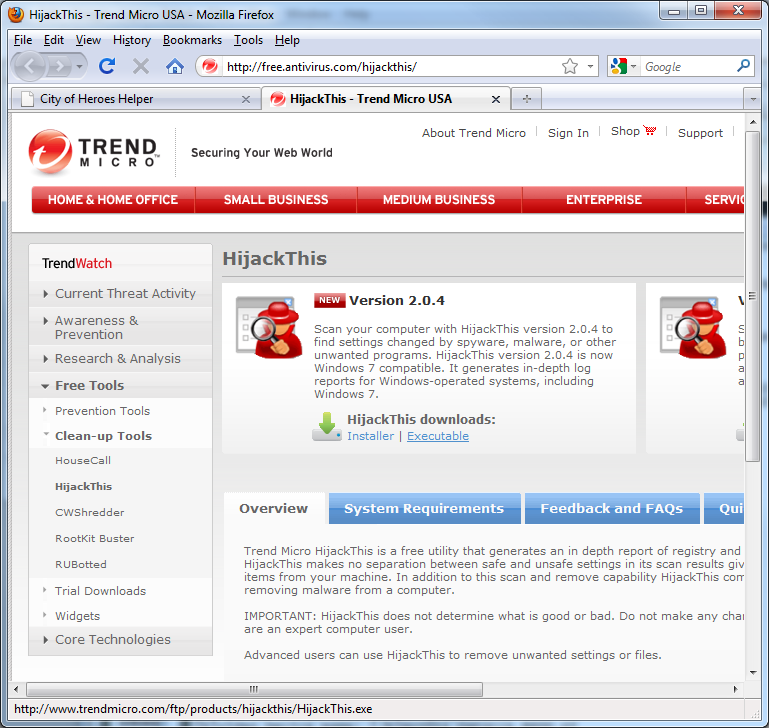 Step Number 7: Go to the Hijack This site. 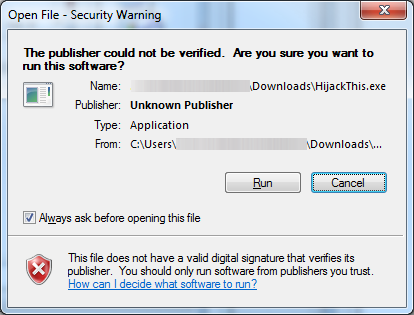 Step Number 8: Download the Hijack This executable. 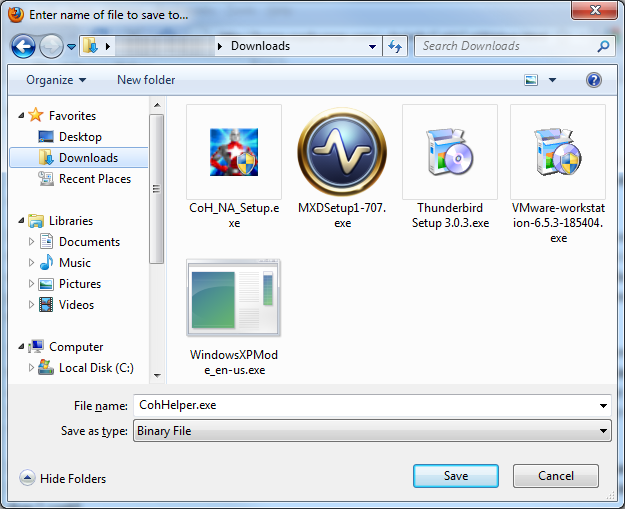 If nothing is really wrong with your computer (other than CoH is not working right) you can try getting the installer. 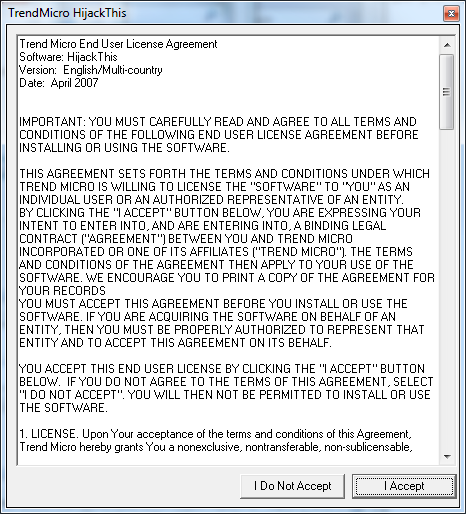 But if your computer is acting really freaky, or refusing to run the installer, just get the raw executable. Step Number 9: Save the file. 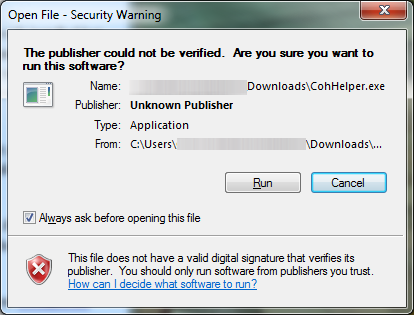 Step Number 10: Run the Hijack This Executable. 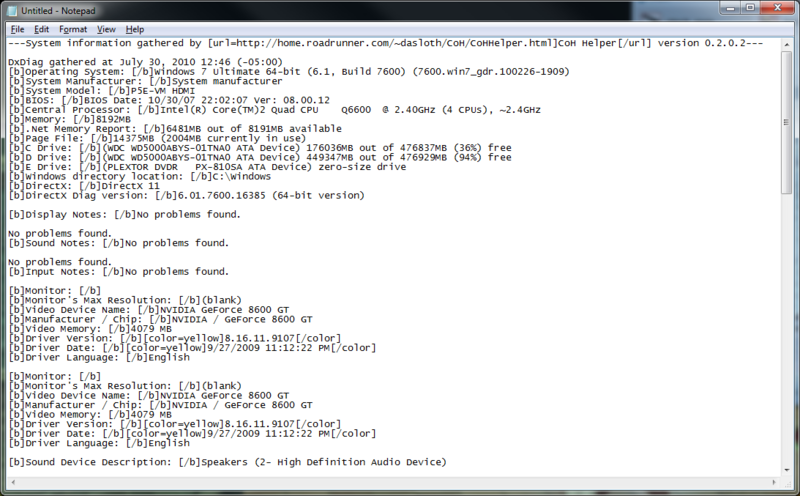 Note: If you’re on a Windows Vista or Windows 7 machine, you’ll get this error. Even running as someone designated a system administrator. 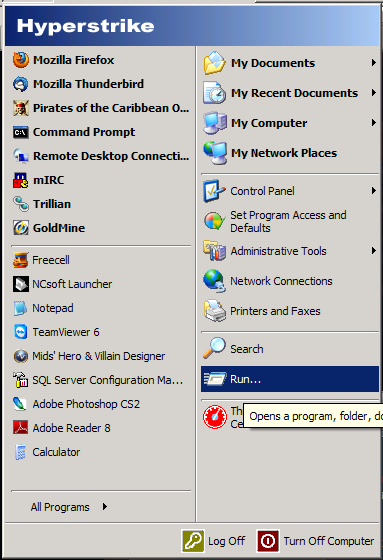 If this happens, browse to the location where you have the file saved, right-click on it and select “Run as Administrator”. 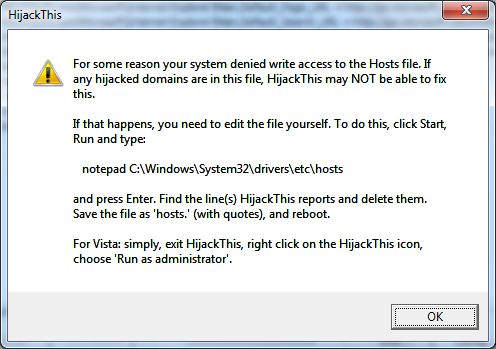 You’ll have a text file automatically open for you with the results of your Hijack This session. Like the log file you created for CoH Helper, you can save this just in case. 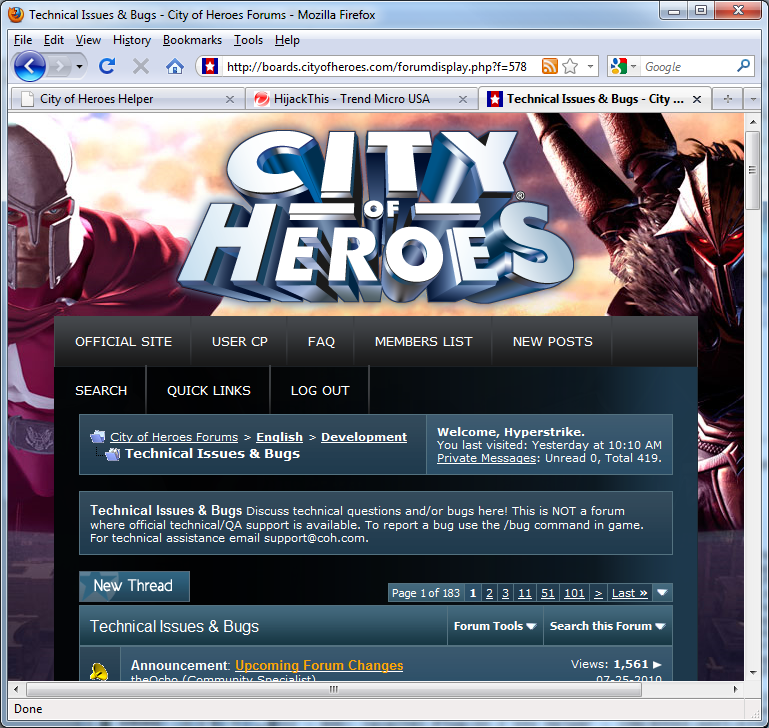 Step Number 13: Go to the CoH Boards and into the Technical Issues & Bugs forum. 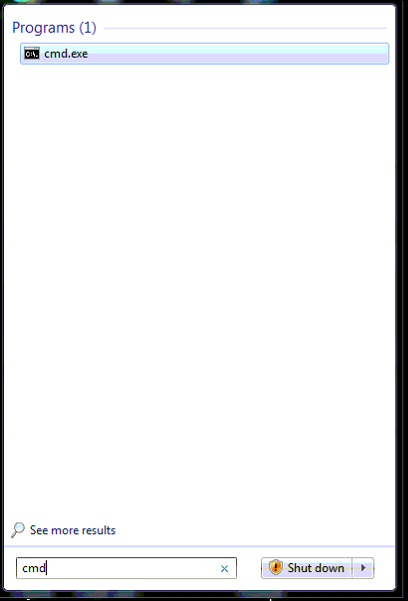 Step Number 14: Create a new post. Give the post a decent title so people don’t just get a “HELP ME!”. It makes it easier on would-be helpers if they know what they’re getting into. Give a nice description of your problem in the body of the post. Anything and everything you can think of that might be affecting it. A breakdown of your system specs would be nice too. Now, posts on the boards that are too long will truncate. And there’s a LOT of data in the logs. So post only your CoH helper log into the first post. Step Number 15: Create a follow-up post immediately. 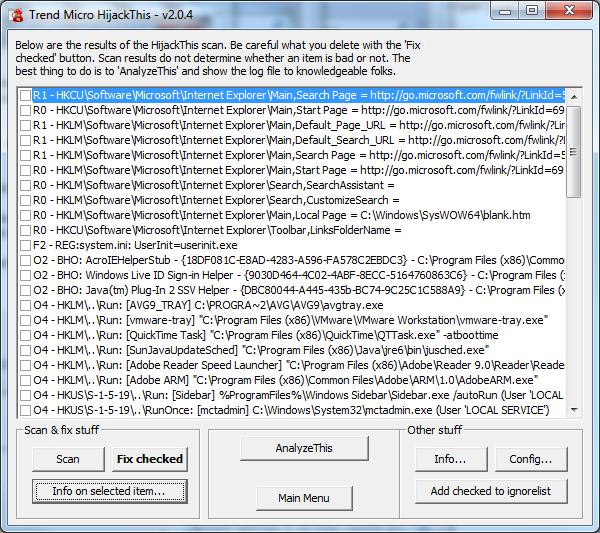 In this post, drop the contents of your Hijack This log. Step Number 16: (For people having rubberbanding or inability to connect or stay connected). In some cases, as in the aforementioned rubberbanding (you start moving, then snap back to your start point, repeatedly), or are having trouble connecting or staying connected to the game, running a pathping can help give some of us an idea what your network conditions are like. Type “CMD” (without the ” “) and hit ENTER. 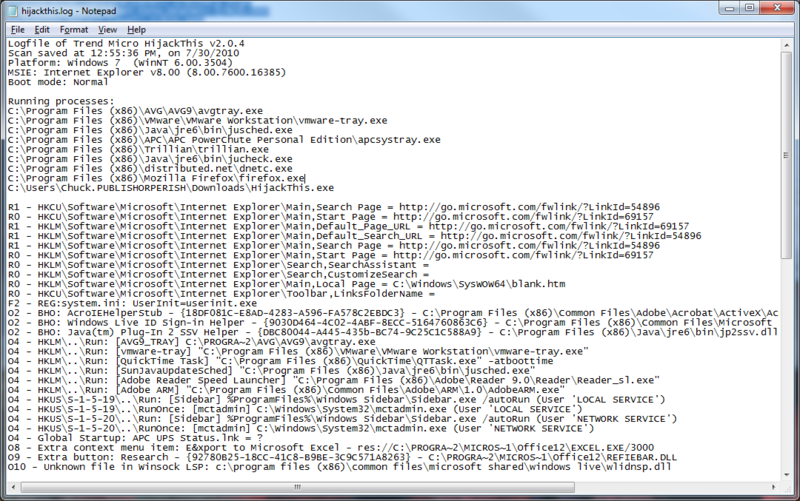 This will bring up a command prompt window. In the search box type “CMD” (without the ” “) and hit ENTER. 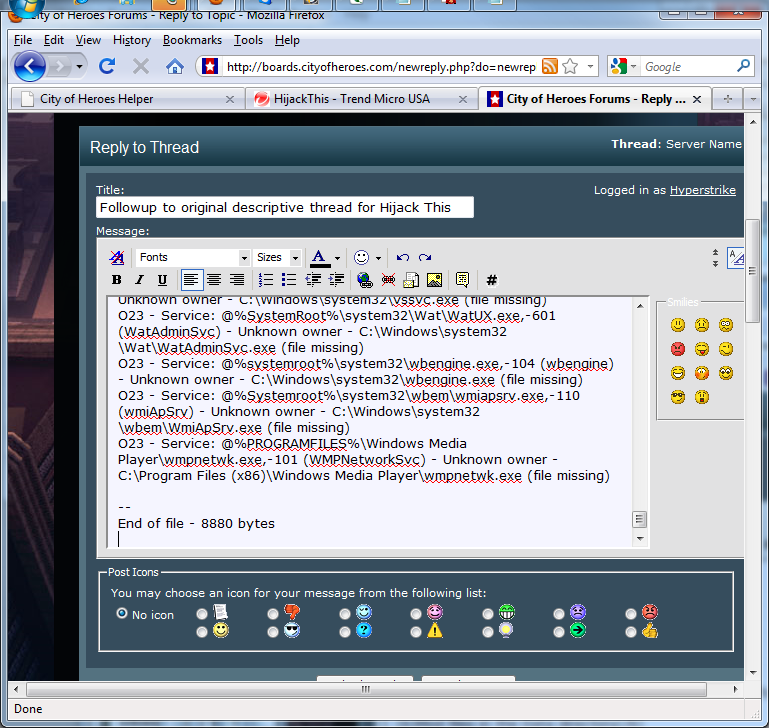 This will bring up a command prompt window. In Vista/7 if you don’t have administrative permissions, you will need to put the file somewhere OTHER than the root of the C:\ drive or you’ll get access errors. 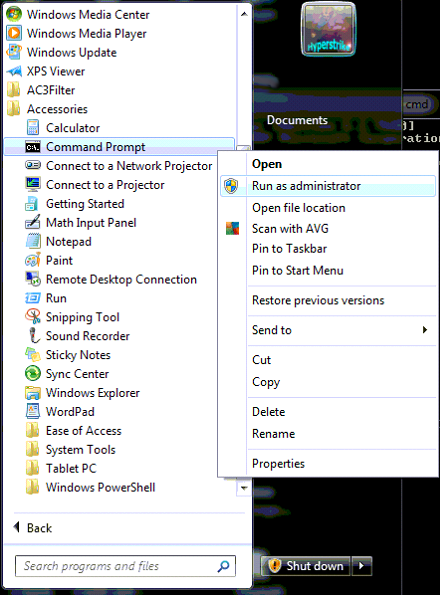 Right-click on Command Prompt and choose “Run as Administrator”. You may or may not be asked to enter a username and password. Step Number 17: Create a followup post with the information in it. As noted, the pathping we had you do created a text file in the root of your C:\ drive. Open it up in Notepad and paste it into the forums as a separate post. Also, to help preserve formatting surround the entire pasted section with [NOPARSE] [CODE] [/CODE] [/NOPARSE] tags. These will help preserve the formatting of the pathping output better than board’s plaintext formatting. [/code] Step Number 18: Sit back and wait for help. But be proactive! Take a look-see at the logs. See if anything weird jumps out at you. Post follow-ups in the thread if something bizzare presents itself that you don’t understand. This will give the technically inclined helpers here a leg up when they try to assist you and should provide you with the absolute minimum of downtime or problem time. [QUOTE=ServerGuy;3973049]This error message occurs when the GPU hangs (or crashes) in response to either a driver bug or a hardware failure. 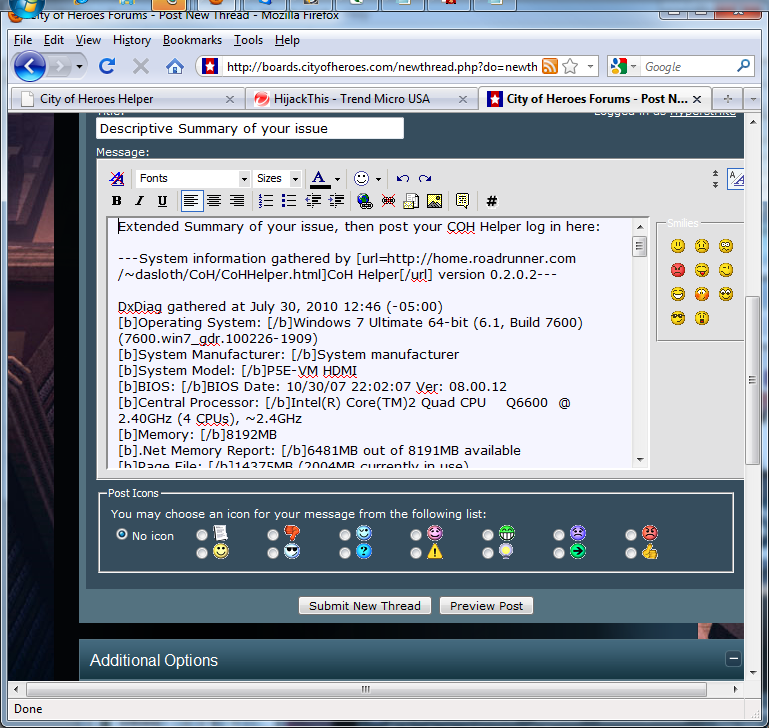 It is also possible for OpenCL and DirectCompute application bugs to trigger this (City of Heroes does not use either of these). On versions of Windows before Windows Vista, this would have resulted in a Blue Screen of Death, but newer versions of Windows require drivers to be able to reset when the GPU crashes instead of forcing Windows to reboot. Unfortunately, 3D applications are not able to automatically recover after this occurs and need to be restarted.